Set of four engravings (after the drawings). From a rare portfolio printed in Switzerland by Spiral Press and published by George Wittenborn of New York. Presumably issued circa 1958, the publisher did not state the date or edition size. Printed on smooth wove paper, each sheet measures 9 1/2 x 12 1/2 inches (240 x 320 mm). Not signed. Medium: original color woodcut. A magnificent and richly inked impression on BFK Rives wove paper from the deluxe limited edition portfolio "Soleil Recerclé", published in Paris in 1966 by Louis Broder. This is one of the 110 unsigned impressions printed (from a total edition of 185). The total sheet measures 19 x 15 inches (480 x 385mm). The image measures 12 x 9 1/2 inches (304 x 240mm). In excellent condition, with the exception of a bump to the corner of the sheet (not affecting the image). Not signed. A lucky find of this rare piece! Medium: original linoleum cut. A nice impression on wove paper, published in 1938 for the very rare XXe Siecle issue No. 4. Sheet size 12 5/8 x 9 3/4 inches (320 x 248 mm). Not signed. Condition: there is a bump to the bottom left corner of the sheet. There are six pinholes along the left edge of the sheet -- this is from the publisher's original binding staples, and also serves to demonstrate the provenance of this piece. Note: a later edition was also issued by XXe Siecle in 1959, but this is the original, first edition. The definitive way to tell is that the original first edition has the pinholes in the margin (glue was used for later issues of XXe Siecle rather than staples). Also, the later edition has a text inscription printed on back; the original has no text on the back. Medium: original lithograph. 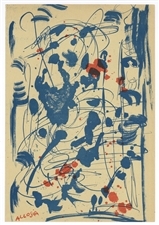 A great work of Abstract Expressionist art, printed on buff colored thin wove paper and published in Milan in 1958 by Groupe Espace for the very rare Documenti d'arte d'oggi. Sheet size 12 3/8 x 8 1/2 inches (315 x 215 mm). There is printed text on the back, as issued (the text is a poem in Italian by Giorgio Simonotti-Manacorda). Signed by Giuseppe Allosia in the stone, not signed by hand. Condition: there is a tiny tear at the right edge of the sheet. Edmond Aman-Jean original etching "La femme a la courbeille"
Medium: original etching. A fine impression on japon paper, published in Paris in 1926 for the Revue de l'Art ancien et moderne. The plate measures 10 3/8 x 7 1/8 inches (263 x 198 mm). The left margin is very narrow (3mm). Not signed. Josef Albers serigraph "Homage to the Square"
"Homage to the Square: blue + darkgreen with 2 reds"
Medium: silkscreen / serigraph (after the painting). This vintage Albers print was published in 1977 by Trautwein KG of Recklinghausen, West Germany. A beautifully printed, rich impression. Image size: 8 x 8 inches (205 x 205 mm). Including the border, the full sheet size: 8 7/8 x 8 7/8 inches (225 x 225 mm). Not signed. Jean Hans Arp original woodcut "Before the Battle of Hastings"
Medium: original woodcut. Printed in Paris by Mourlot and published by Pierre à Feu and Maeght Editeur for the Marcel Duchamp / André Breton project Surréalisme en 1947. Issued in a limited edition of 999. Size: 9 1/8 x 7 7/8 inches (232 x 200 mm). Not signed. Jean Hans Arp original woodcut "After the Battle of Hastings"
Medium: silkscreen / serigraph. This is one of the silkscreens from the important Josef Albers project "Interaction of Color", published in 1963 by Yale University Press in an edition of 2000. The total sheet measures 13 x 20 inches (330 x 510 mm). Not signed. This is a fine impression printed in rich, vibrant color and now very scarce. Condition: there is some scuffing and scratches to the printed surface. This work was issued as a folded sheet with a center crease. Condition: there is some scuffing and a few scratches to the printed surface. This work was issued as a folded sheet with a center crease. "Homage to the Square: R-1 d-5"
Medium: silkscreen / serigraph (after the painting). This vintage Albers print was published in 1977 by Trautwein KG of Recklinghausen, West Germany. A beautifully printed, rich impression. Not signed. Image size: 8 x 8 inches (205 x 205 mm). Including the border, the full sheet size: 8 7/8 x 8 7/8 inches (225 x 225 mm). "Homage to the Square: R-III a-4"
"Homage to the Square: Yes Sir"
"Homage to the Square: Selected"
Josef Albers silkscreen "Homage to the Square"
"Homage to the Square: La Tehuana"
"Homage to the Square: Grisaille and Patina"
"Homage to the Square: Renewed Hope"
"Homage to the Square: Protected Blue"
Medium: silkscreen / serigraph. This is one of the silkscreens from the important Josef Albers project "Interaction of Color", published in 1963 by Yale University Press in an edition of 2000. The total sheet measures 20 x 13 inches (510 x 330 mm). Not signed. This is a fine impression printed in rich, vibrant color and now very scarce. Condition: there is some minor soiling. This work was issued as a folded sheet with a horizontal center crease. Medium: serigraph (after the original). Issued in 1969 in an edition of 420 for "Correspondances", published by Editions des Nouvelles Images a Lombreuil, Loiret. This magnificent, rich impression on BFK Rives wove paper was printed in Paris by serigrapher Robert Guige. The image is 10 3/4 x 7 7/8 inches (270 x 200 mm) and the full sheet measures 12 3/4 x 9 3/4 inches (325 x 250 mm). Not signed. Rare. Medium: silkscreen / serigraph. This is one of the silkscreens from the important Albers project "Interaction of Color", published in 1963 by Yale University Press in an edition of 2000. The total sheet measures 10 x 13 inches (255 x 330 mm). This is a fine impression printed in rich, vibrant color and now very scarce. 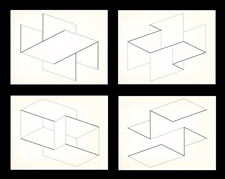 This particular piece is actually a multiple, as the vertical center strip can be lifted to reveal the continuation of Josef Albers' composition beneath. Not signed. Medium: silkscreen / serigraph. This is one of the silkscreens from the important Albers project "Interaction of Color", published in 1963 by Yale University Press in an edition of 2000. The total sheet measures 10 x 13 inches (255 x 330 mm). Not signed. This is a fine impression printed in rich, vibrant color and now very scarce. Condition: there are some scratches to the silkscreen surface of the print. Medium: silkscreen / serigraph. This is one of the silkscreens from the important Josef Albers project "Interaction of Color", published in 1963 by Yale University Press in an edition of 2000. The total sheet measures 13 x 10 inches (330 x 253 mm). Not signed. This is a fine impression printed in rich, vibrant color and now very scarce. Condition: there are a few scratches to the printed surface and a black mark near the bottom left. Medium: silkscreen / serigraph. This is one of the silkscreens from the important Josef Albers project "Interaction of Color", published in 1963 by Yale University Press in an edition of 2000. The total sheet measures 13 x 10 inches (330 x 250 mm). Not signed. This is a fine impression printed in rich, vibrant color and now very scarce. Condition: there are some minor scratches to the printed surface. Medium: silkscreen / serigraph (after the original). This particular variation of Albers' Homage to the Square series is called "White Line Squares". Printed in Germany by Atelier Herbert Geier and published in 1968 by George Wittenborn of New York, for a now very scarce catalogue raisonne. Image size: 8 3/4 x 8 3/4 inches (225 x 225 mm). Including the border, the total sheet size: 10 1/2 x 9 3/4 inches (267 x 250 mm). There is another composition on the back, as issued. A beautiful, rich impression. Not signed. Medium: silkscreen / serigraph (after the original). Printed in Germany by Atelier Herbert Geier and published in 1968 by George Wittenborn of New York, for a now very scarce catalogue raisonne. Image size: 8 3/4 x 8 3/4 inches (225 x 225 mm). Including the border, the total sheet size: 10 1/2 x 9 3/4 inches (267 x 250 mm). There is another composition on the back, as issued. A rich impression in electric color. Not signed. Condition: there is age-toning to the margins. Condition: there is some minor creasing. This work was issued as a folded sheet with a center crease. Condition: there is some minor creasing and soiling. This work was issued as a folded sheet with a center crease. Medium: silkscreen / serigraph. This is one of the silkscreens from the important Albers project "Interaction of Color" published in 1963 by Yale University Press in an edition of 2000. The total sheet measures 10 x 13 inches (255 x 330 mm). Not signed. This is a fine impression printed in rich, vibrant color and now very scarce. Condition: there are a few scratches to the surface. Condition: there are some scratches to the surface. Condition: there are old labels attached to the back of the sheet, but this can't be seen from the front and does not affect the silkscreen image. Condition: there is a small black mark above the central composition.